Are you looking for a delicious recipe with a difference? If you are, you’ve found it! 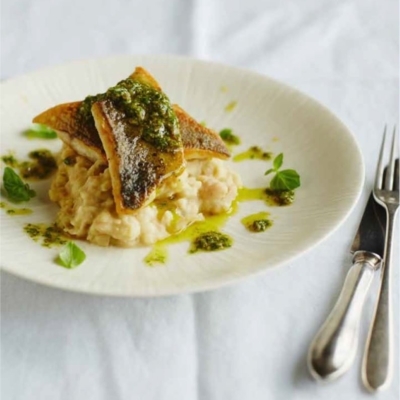 Here’s my pan-fried sea bass with cannellini mash & basil sauce for you to enjoy. It has often been said that beans are the meat of the poor man, as they are a healthy alternative to meat, but in Italy, beans are used in pasta dishes, salads, mashed and spread on bruschetta – to name but a few options. They are used all day every day and are so incredibly good for you – packed with protein and soluble fibre, they make a really wonderful alternative to potatoes. The creamy bean mash here will not disappoint and complements the sea bass and the fresh basil sauce perfectly. 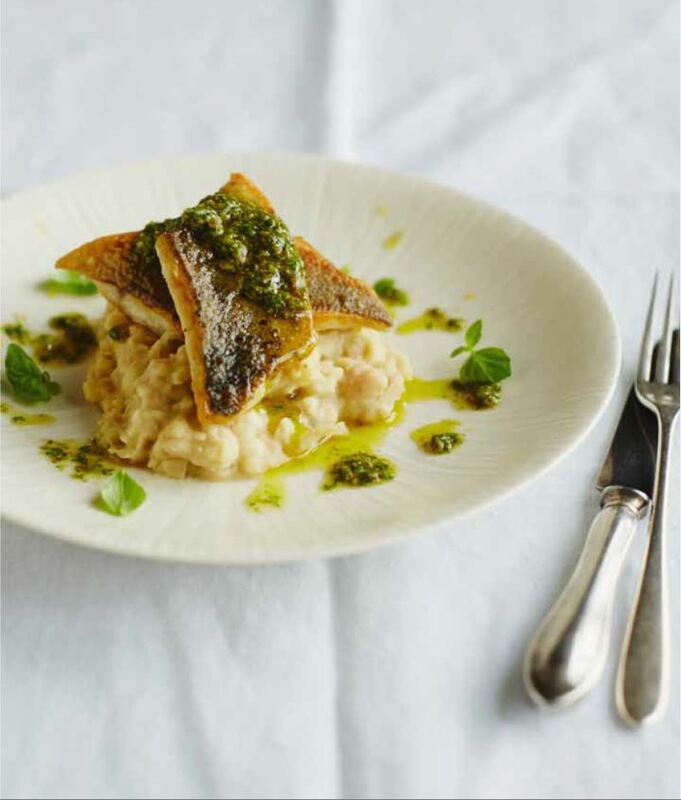 Feast your eyes on the finest pan-fried sea bass with cannellini mash & basil sauce! It’s straightforward and fun to make this great dish. Simply follow the instructions below and get the perfect result. Prepare the cannellini mash by pouring the oil in a medium saucepan then add the garlic and fry for 20 seconds. Add the beans and cook on a medium heat for 10 minutes, stirring occasionally. If the mixture appears to be dry, add a little hot water. Season with salt and pepper and use a potato masher to gently crush the beans. Cover to keep warm and set aside. For the basil sauce, place all the ingredients in a food processor or blender and blitz until smooth. Season with salt and pepper and set aside. Cut each fish fillet in half, season with salt and pepper and lightly flour both sides. Heat 4 tablespoons of olive oil in a large frying pan over a medium heat and fry the fish, skin side down, for 3 minutes. Gently turn each fillet over and cook for a further 2 minutes – the fish is ready when firm to the touch but not dry. Put equal amounts of the cannellini mash in the centre of 4 warm serving plates, place the fish fillets on top, drizzle over the basil sauce and scatter over the reserved basil leaves. Serve immediately. 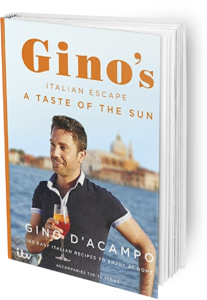 Once you’re done, simply sit back and enjoy your pan-fried sea bass with cannellini mash & basil sauce and don’t forget to check out other great authentic Italian recipes including great antipasti recipes, Italian pasta recipes, Italian soup recipes, Italian beef dishes and authentic pizza recipes.